Recently, we have seen a transition with many operators evolving from traditional Internet Service Providers (ISPs) to LTE carriers who provide fixed line, WiFi, and mobile connections. At the same time, their needs for authentication, authorization, and accounting (AAA) become more complex. As an example, on top of a standard RADIUS AAA infrastructure, these carriers may need Diameter interfaces and a 3GPP AAA server. For Radiator customers, we have made this transition as easy as possible - and with the flexibility of Radiator, it is easy to bring it to different infrastructures as a new solution. As many of our customers have evolved from ISPs to LTE Carriers, their needs for different features have evolved at the same time. For these needs, we have developed Radiator Carrier class product line. In order to ensure cost-effective solutions, we offer a modular approach where you can purchase only the components that you will need in your project. For example, many of our customers have used Radiator for both fixed and WiFi access for years. When they need to enable VoWiFi calling features, they can just add Radiator SIM Module to their network, and in this way, enable different EAP-SIM / EAP-AKA / EAP-AKA’ authentication methods and have a fully featured 3GPP AAA Server in their network as well. Another example is our Radiator GBA/BSF Module that provides easy authentication for VoLTE supplementary services. This way you can ensure that VoLTE supplementary services (call forwarding, knocking, call barring) are in use in your LTE infrastructure without resorting to 2G/3G infrastructure. If you are interested in Radiator features such as Diameter interfaces, online charging, VoWiFi, or 3GPP AAA Server, you can find more details in our website or contact our sales team at sales@radiatorsoftware.com. We will be happy to help you with your project. Improved support for Hotspots and subscription quotas! New Radiator release version 4.22 will introduce an improved support for Hotspot functionality, including differentiated services and prepaid/postpaid quotas. - <ServiceDatabase INTERNAL> stores service definitions and subscription data within in-memory. - <ServiceDatabase SQL> stores service definitions and subscription data within SQL database. Existing <SessionDatabase INTERNAL> and <SessionDatabase SQL> modules have been updated to work seamlessly with new <ServiceDatabase> modules for RADIUS accounting based quota control. A new generic <AuthBy HOTSPOT> module which combines <ServiceDatabase>, <SessionDatabase>, an authenticating <AuthBy>, and possible <AuthBy DYNAUTH> (RADIUS Dynamic Authorization) for sending CoA/DM e.g. after a successful authentication or when a quota has been depleted, into a working solution which can be used with captive portals (for example MikroTik) and network access controllers supporting RADIUS. Beside Hotspot use-case, the same solution can also be used to implement a quota control for fixed-line access or cellular APN. A new <AuthBy HOTSPOTFIDELIO> module based on <AuthBy HOTSPOT> which uses Radiator Fidelio/Opera PMS integration for authenticating and billing guests. Note that <AuthBy HOTSPOTFIDELIO> obsoletes previous <AuthBy FIDELIOHOTSPOT> module. Implementing a guest network access with Radiator using Fidelio/Opera PMS integration. # Service 1: free, 1 hour, 50M data, no policers  Service name:free price:0 prepaidTime:1h prepaidQuota:50M replyItems:"OSC-AVPAIR=Test1,OSC-AVPAIR=Test2"
# options. Note: "name=radius0-9048" is OSC-AVPAIR. # an optional prefix to choose the correct instance. # you can ask the guest to confirm the charge first. #ConfirmationMessage "You are going to upgrade or renew your plan, please login again to confirm the charge"
Fixed nested and cascaded AuthBy GROUPs that stopped working in Radiator 4.20. Unified AuthBy HANDLER functionality and reverted some of its changes done in Radiator 4.20. JSON authentication and accounting log now formats time as numeric type instead of string. ServerTACACSPLUS connection handling had major updates. For a detailed list of changes, visit the Radiator revision history page. We are happy to announce that Radiator 4.20 is published today! For a detailed list of changes, see Radiator revision history page. Radiator team is present at Mobile World Conference in Barcelona on 26 February – 1 March. Come to meet us in hall 3 (3B10), Finland Pavilion and discuss newest features of Radiator and Radiator VNF or learn about the latest use cases. We can also arrange a meeting with you, please contact Jaakko Stenhäll (jaakko.stenhall@radiatorsoftware.com) for more details. Our partners use Radiator® widely in their own solutions. Here we introduce you Authus network security solution, provided by our partner company HenZ ICT. Authus uses Radiator AAA Server for fast, reliable, and stable authentication. Like Authus, Radiator is platform-independent, which makes the combined solution flexible to integrate into different environments. Radiator performs the initial authentication within Authus network security solution. After the initial authentication, Network Access Engine determines whether a client is permitted access to the network and with which type of profile. The decisions are based on the Authus Validation Rules. The profile defines which VLAN (Virtual LAN) the client gets access. Furthermore, Authus includes Reporting Engine, which uses a database to store AAA (Authentication, Authorisation, Accounting) information. Based on this data, dashboards show the status and operation of the Authus system. Authus offers also other functionalities for support purposes, such as trace functionality and dashboards on transaction level. If you are interested to know more about use of Radiator with Authus or the combined solution, please do not hesitate to contact our Radiator sales team at info@radiatorsoftware.com. Also, you can contact Authus team at info@henz.nl. New Radiator version 4.20 introduces support for OCSP and OCSP stapling for TLS based EAP methods (such as EAP-TLS, EAP-TTLS, and EAP-PEAP) and RadSec (TLS encryption for RADIUS over TCP). OCSP (Online Certificate Status Protocol) is a method for checking certificates' revocation status online and is used as an alternative for CRL (Certificate Revocation List) files. Whereas CRL files needs to be updated every now and then, OCSP uses queries sent to CA (Certificate Authority) to obtain the latest revocation status. Radiator uses OCSP to query and verify that EAP supplicant's or RadSec peer's certificate has not been revoked and can provide OCSP staple to EAP supplicants and RadSec peers to verify that Radiator's own certificate has not been revoked. More info about OCSP and OCSP staple can be found from the references at the end. In this blog post, we show two configuration examples how to enable and test OCSP support. We use demo certificates bundled with Radiator which do support OCSP. You can check whether your X.509 certificate contains OCSP URL with the commands shown below. For testing OCSP, we run OCSP responder provided by OpenSSL library. Normally, CA who has signed the certificates runs OCSP responder on the Internet. Leave OCSP responder running on http://127.0.0.1:8008/ and waiting for OCSP queries from Radiator. # Provide OCSP staple for EAP-TLS clients asking for it. # but before authenticating and authorizing the client. # Reject EAP-TLS client certificate when OCSP responder is unavailable or OCSP status query fails. # By default, only a valid OCSP status response can reject EAP-TLS client certificate. # Use specified OCSP URI for OCSP queries instead of OCSP URI in EAP-TLS client certificate. # If OCSP query to OCSP URI fails, mark OCSP responder failed for 10 minutes. Besides TLS based EAP methods, OCSP can also be used with RadSec peerings, either with or without OCSP stapling. # Request OCSP staple from RadSec server. # Alternatively, check OCSP status of RadSec server certificates during TLS handshake. # response can reject RadSec server certificate. # Provide OCSP staple for RadSec client requesting it. # Check OCSP status of RadSec client certificates during TLS handshake. # Use specified OCSP URI for OCSP queries instead of OCSP URI in RadSec client certificate. 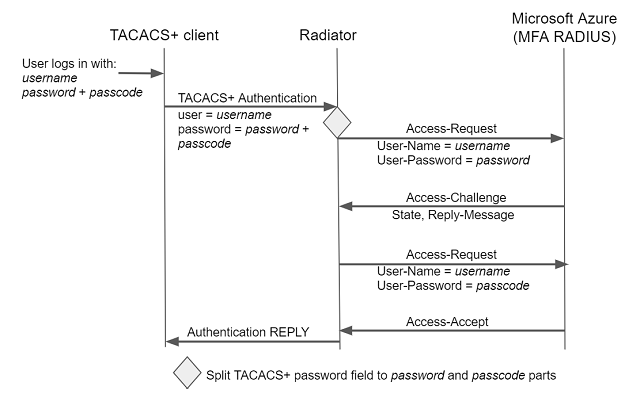 Radiator acting as RadSec client (AuthBy RADSEC) will connect to Radiator acting as RadSec server (ServerRADSEC) and will request OCSP staple to be returned during TLS handshake. Server will get OCSP response for its own certificate and return it as OCSP staple to the client and when the client has sent its certificate, the server will query its revocation status with OCSP before accepting it. Radiator AAA Server Software has countless use cases in enterprises. This blog text introduces you a specific use case of real life: authentication of network administrators who configure and maintain corporate network infrastructure. This requires extra security that Radiator is able to provide. In the example use case, the admins log in to Broadband Network Gateways (BNG) with TACACS+ protocol using their own authentication credentials and passwords. For essential network equipment, a secure two-factor authentication (2FA) is used. Radiator supports a wide range of interfaces for these kinds of authentication use cases. Our customers are free to choose the interfaces and protocols that suit to their own needs. LDAP user database provides the first factor authentication in the example use case. The second factor is handled by Duo Security. With AuthBy DUO module, you can configure Radiator to integrate with Duo Security API, which in this case provides the second phase of authentication with Duo Security’s phone application. After the authentication has been confirmed by the application, Radiator will grant access to the network. In addition to TACACS+ protocol, Radiator supports wide range of different authentication protocols that you can use – including RADIUS. It is also possible to use different methods for the first factor authentication and second factor authentication. Radiator supports a number of interfaces suitable for the second factor authentication, and we already have use cases with several different solutions. These interfaces are included in Radiator licences. If you have any needs for two-factor authentication in your own network, please contact our team at info@radiatorsoftware.com. We are happy to share our experience and help you with your own project. You can also learn more about the technical architecture from our earlier post: Secure your network and services with Radiator two-factor authentication.